Normally I wake up on a weekend wanting breakfast tacos, but not this past Saturday, all I could think about was pancakes with some lovely blueberry syrup. Turns out I had the blueberries in the freezer, all there was to do was whip it all up for an easy breakfast! This made four exactly and served two, but can easily be doubled. Also, from experience, I would start the pancakes first then work on the sauce while the pancakes are going! Enjoy! Mix up the flour, egg, baking powdering milk and ½ tsp. sugar in a bowl. In a cast iron skillet, heat a tiny bit of oil and rub it all over the pan with a paper towel. When it’s hot about 5 minutes, pour on the first pancake, turn the heat to med-low and leave it alone for about 4-5 minutes or until you start to see air bubbles on the top. Flip, and wait a further couple of minutes until nice and golden on the other side. As the pancakes are cooking, throw the blueberries, orange juice, water, cinnamon and 2 tbsp. sugar and melted butter into a small saucepan. Bring to a boil and simmer for 10 minutes or until a thick lovely syrup has formed. When the pancakes are done, butter them up and pour the blueberry sauce on top! I have to admit, this isn’t totally my recipe idea, I adapted it from a chefs recipe I saw on TV. It was a 15 minute meal special and I didn’t believe him so I made my own. The original recipe was with squid and needless to say I did not like it at all. I decided to try my hand at a prawn one and I really enjoyed it! I just have to post it because it literally took nearly 20 minutes. So so so easy, and everyone needs easy. This is for exactly two servings, but I would just double it if you want to make more! Enjoy. In a food processor, add the onion, spinach bouillon powder and blitz up until it’s almost a paste, a few seconds. Add the couscous and stir around. Next add the boiling water, try to pour it all around. Pop the lid on the processor and let sit until you’re ready to serve. Slice the pepper, onion, and chorizo. In a hot pan put the chorizo down until it starts releasing some fat, about 2 minutes. Next add the peppers and onions and sauté for a good 5-7 minutes until the chorizo crisps and the peppers soften. Next add the prawns continuing to stir until they get a pink color. Crush in the garlic and add the honey, stirring around until it gets a nice caramelized color and there’s a real crisp to the veggies. Next deglaze with the vinegar scraping the bits off the pan, and then you’re done. Serve hot over the couscous! 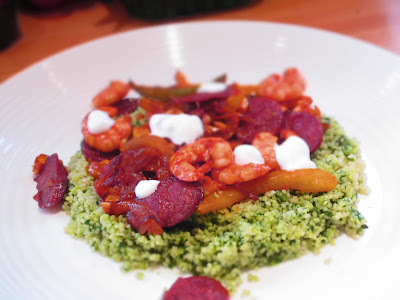 Who says that a tagine has to be cooked for ages and ages? Well I have a recipe that will give you everything you want from a tagine that has been cooked down for hours, except not! This is so easy you could do during a busy week day, you could even use any type of meat you want, and I used lamb because it’s a traditional flavour profile but I am going to try turkey next. This serves 3-4. Enjoy. Dice onion, apricots, and dates. Steep saffron in 1.5c hot water with stock cube or stock powder. In a saucepan, heat oil, and brown lamb with diced onion and apricots. 6 minutes or until cooked through. Next add dry spices, cumin, coriander, ginger, cinnamon, cardamom pods and turmeric, stir continuously until fragrant. Add the flour and mix thoroughly about 3 minutes. Next add the drained chick peas, honey, almonds and stock with saffron. Stir thoroughly and simmer for 15 minutes on low heat. Right before being done toss some mint leaves on it for a few minutes. I had some extra pork mince and I wanted to do something old school and summery, but give it a twist! This was the perfect thing for me, as I’ve never made sloppy Joes from scratch. For any of you that don’t know what a Sloppy Joe is, traditionally it’s beef mince with a sauce made out of ketchup and Worcestershire sauce and other spices that make it a really sloppy meat patty you throw on a bun and get messy! It’s a delicious treat and I will be making my version again, which is with pork and bacon! This recipe makes 2-3 depending on how much you want on your bun, enjoy! Dice the onion and pepper fairly small. In a large skillet heat the oil, and add the bacon onions and peppers. Cook until the bacon gets crispy, but don’t burn the onions. About 5 minutes. Next add the pork mince and break up with a spoon until really fine, until completely cooked a further 5 minutes. Next add the ketchup, mustard, brown sugar, Worcester sauce, garlic powder. Mix thoroughly and simmer, on low for a couple of minutes until the sauce heats thoroughly. To serve, plop the mixture on any buns of your choice and enjoy! I had some pork mince and I wasn't sure what to do with it, so I decided to make some meatballs! I've made meatballs before but I wanted to try something new, a new way to keep the flavor and to keep it moist. I decided to grate an apple in for some added texture and it worked out great, the meatballs came out really lovely and juicy. These would be great with a sauce, or simply eaten on their own or in a sandwich! Really good. This is a small portion for two people and it makes 8 meatballs, you can double it for a family portion quite easily.Enjoy! Chop the onion and the pepper as finely as you can. Grate as much of the apple as you can skin and all. Clean your hands and mix it up with your fingers, it’s the only way to get it all mixed thoroughly. Form the meatballs by rolling into a ball in your hands, I made 8 with this recipe so about golf ball size. In a non-stick skillet, heat some oil, when hot add the meatballs and turn continuously. Cook about 5 minutes on each side. When the meatballs are done they’ll feel very firm when you press into them they will resist. Enjoy hot with some sauce, or on their own in a sandwich!